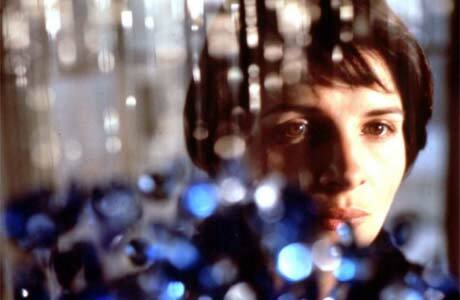 Juliette Binoche is the lead here, playing Julie, a woman who has just lost her husband and child in a car crash. She doesn't seem to be dealing with it that well, and sets out to paralyse her emotions and basically 'disappear' from the world. However, she finds that while she is trying to cut herself off from her former life, she can not cut off her human connections, and as she tries to live in isolation she finds out the truth about her late husband. The film deals with the theme of 'liberation' by showing that Julie is liberated after her husband and child die. This isn't necessarily a good thing, but I couldn't help but think of a particular quote to describe Julie, ironically from another Juliette Binoche movie, Certified Copy: "my family lives their lives and I live mine." This particularly becomes more evident as the film wears on, as Julie finds out the truth and desperately tries to live her own life. Binoche is amazing, as always, here, with her face doing a large majority of the acting. I didn't think that Julie was a particularly likeable character but it's easy to feel what she is going through, which is thanks to Binoche's calculated performance. However, the biggest star of this movie for me was the music. The music played a vital role in the movie, often being used as a narrative device. It was beautiful music, indeed. This one is generally perceived as the worst of the trilogy, but that doesn't mean that it is at all bad. I actually found this one far more enjoyable than Blue, as that movie was occasionally quite pretentious (sorry to any arthouse fans which I may have offended with the use of that word, but that's my opinion), yet this movie was a black comedy, a genre which I genuinely enjoy. I felt like this movie took itself seriously enough to not be taken seriously, which was a strange thing, but I liked what Kieślowski did here. Ultimately, it's a saddening tale, particularly as our hero Karol Karol (Zbigniew Zamachowski) is given the job of assisting a man's suicide. Also, the end is a particularly memorable one, which I felt sad about at first, but then I also realised how much it showed the film's theme of equality. I can't figure out whether that equality was cruel or fair, which of course got me thinking a little bit about equality and how strange it is. The problem I had with White was the fact that it didn't have a strong story like Blue and Red, and it was a little different in tone compared with the other two. While it is probably the worst film of the lot (it is still really good), I'm tempted to say that White is the most accessible out of the three. It is rather entertaining and occasionally deeply affecting. In the strangest of ways. Red is hands down my most favourite film out of the trilogy, and will definitely be making it's way into the higher section of my favourite films of all time. The reason why I loved Red so much was because it tells the story of something which I often think about: how different people's lives interconnect in the most mysterious ways. The way that Kieślowski makes the story of the retired judge Kern (Jean-Louis Trintignant) and the beautiful model Valentine (Irene Jacob) parallel with the story of student Auguste (Jean-Pierre Lorit) and his girlfriend Karin (Frederique Feder) is intriguing. It really got me thinking of how strangely different lives can parallel each other and how fate and destiny can control some things. I just found a lot more to mull over with Red, which is something that hadn't happened to me with Blue and White. It actually seems to cover everything, much like I believe that The Tree of Life tried to do, but it did this with a lot more ease and fluidity. Maybe it's not a film about existence for anyone else, and maybe I just read a little too far into it. But it took me another watch early this morning to fully realise the many things that this film was trying to say, which was as satisfying as ever. Red is a masterpiece, pure and simple. And that final twist is shocking, with the final image etched in my memory forever. I blame Kieślowski and his work with Red for making me walk around all day like I'm part of a French arthouse film. Have you watched this trilogy? What did you think of the films? Glad you liked the trilogy. BLUE definitely needs some time to mull over before you appreciate it, but it is a beautiful film. Binoche is my favourite actress (aside from Isabelle Huppert in THE PIANO TEACHER, simply the best acting performance of all time). RED is of course my favourite too. I just love the dialogue... it is so enriching and beautifully written. 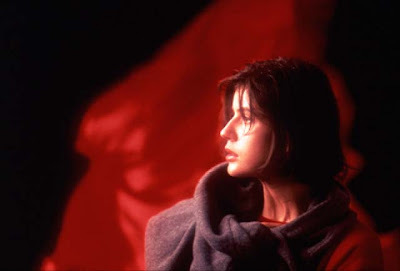 The storyline is achingly beautiful, as is Irene Jacob, and the connection between her and the Judge forms one of the greatest friendships in movie history. The end scene (particularly the astonishingly beautiful final shot of Jacob) almost made me cry. The music that you and I both love is by Polish composer Zbigniew Preisner, who made the music for all Kieslowski's films, and when Kieslowski died, wrote a whole album of music dedicated to him, calling it Requiem for My Friend. Definitely check out some of Preisner's music, it is all wonderful. I have not seen White, and it's been a while since I saw the other two. I definitely remember liking Red a lot, but I really need to revisit these films with a fresh, more grown-up and understanding (hopefully) perspective. I need to watch all of Kieslowski's films eitherways. Blue is my favorite of the trilogy due to its visuals and that story of a woman in anguish. In fact, I love all three of those films as each one had something different to offer. I'm hoping to get the Criterion DVD set for the holidays so I can give away my old copy to the local library. Oh, as far as the music of Preisner is concerned. You might've heard some of his work in that famous Creation sequence in The Tree of Life. I love Preisner's work. I only ever saw Blue, and I wasn't particularly impressed by it, which is probably why I never saw the other two. For that matter I've been left cold by pretty much anything I've seen with Kieslowski's name attached (especially L'enfer, which was made posthumously from one of his scripts and which irritated five shades of hell out of me). Ok, that does it. I HAVE to get on this trilogy already. I actually rented RED a long while ago but never got around to seeing it for some odd reason. Perhaps I'll try to see one every week. Great review of all three, Stevee! Great writeup! Criterion just released these on BluRay last week, so I'm going to have to pick up a copy soon. It's about time I watch them again. Tyler - I love Binoche, too. I think she is freakishly beautiful. Gosh...that ending was so amazing. I did not see that one coming at all. I think I've seen that album somewhere...I'm just not sure where. This is going to bug me for the rest of the day, now. Nikhat - Yeah, I'd like to watch these in a few years time with a different, more grown up perspective on them. I think that would really help. And I've seen four of his films (this trilogy and The Double Life of Veronique). He was a brilliant film-maker! Ruth - Definitely give them a go. They're brilliant! Bonjour Tristesse - I'd love to have the Criterion blu-ray! That's so awesome. Hope you like them...again. Alexandre - Wow, that's interesting. It was a very interesting love story indeed! I'm very much in the minority on this, but my favorite of the trilogy is Blue, in no small part because of the music. However, I also liked that story the best. And I NEED to see these films as a matter of urgency! Will get on it right away!